Thanks, please feel free to let everyone know about it especially those who like to write as well. I know Facebook is a swear-word for many people but i’m in a couple of IF groups (and co-admin a couple of them) on FB so you’d be very welcome to join and share it there also. Yes, I have shared it in many of them there as well. Taking a text based game to another level we have started this Scenario today. It will be all automated and non-committal (come and go as you please). 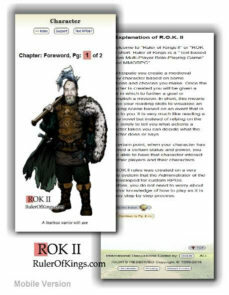 All Players will need to worry about is role-playing their text based character.